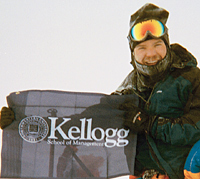 First-year Kellogg School student Bo Parfet has taken on the challenge of climbing the "Seven Summits" of the world, the tallest mountain on every continent. For each climb he completes, an educational scholarship is awarded to someone who needs it in the community near the mountain. Parfet has climbed four of the seven mountains and has impacted the lives of numerous people in need. For his first climb, he ascended Mount Kilimanjaro in Tanzania. For this ascent, he raised $14,000 through personal contacts and donated it to two African medical school students to assist with their tuition payments. Next was South America, where Parfet climbed Argentina's Mount Aconcagua. There, he raised $4,000 to fund a teacher's salary for an entire school year in Buenos Aires. In North America, Parfet tackled Mount McKinley in Alaska, garnering enough money to award 10 $500 scholarships to Alaskan natives. During winter break, Parfet traveled to the icy masses of Vinson Massif in Antarctica and raised $2,000 to fund research through the Explorer's Club, an international professional society for explorers and field scientists worldwide. When he achieves his goal, Parfet will be part of an elite club of less than 200 people who have conquered the Seven Summits. After Mount Everest this spring, he aims to climb Australia's Mount Kosciuszko and Europe's Mount Elbrus, located in Russia.